These are Strawberry Rhubarb Hand Pies that I made from THIS RECIPE pinned on my Just Desserts board. 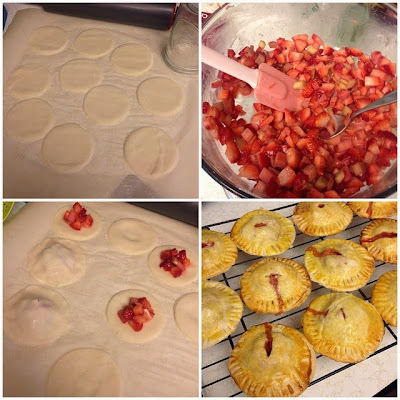 I loved making these almost as much as I loved eating them! I will make these again with different variations for sure. 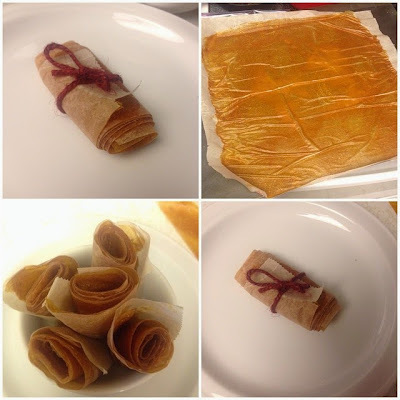 And this is the Easy Fruit Leather from my Kids Snacks to Try board. This was pretty easy to make but I don't know that I will be making it again. 3 hours in the stove with such a low yield doesn't completely seem worth it to me. Also, I found out if you bag it up over night it is WAY better the next day. It is kind of crunchy when it comes out of the oven, but it totally softens overnight in a sealed container. I liked the texture a lot more on day 2.